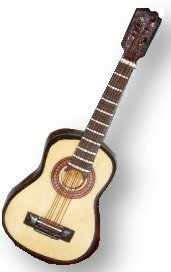 This wonderful miniature wooden acoustic guitar ornament is fitted with a musical movement. There is a small key at the back of the guitar and when wound the musical movement plays 'The Entertainer'. 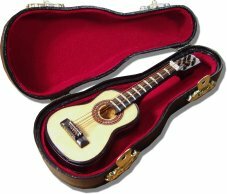 The miniature guitar comes complete with a velvet lined hard case and a stand. A fantastic little novelty gift for the guitarist. This is an ornament and is not designed to be played as a guitar.